For a democratic secular Iran. For peace and prosperity in the Middle East. : What is in the Letter and Behind the Smiles? These pictures are taken only one day after the televised debate between Ahmadinejad and Moussavi. It is the anniversary of Ayatollah Khomeini's death with all the top establishment figures gathered at his mausoleum. 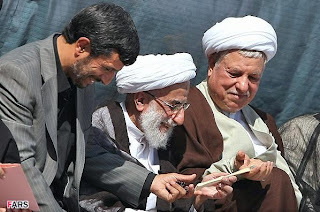 After Ahmadinejad dropped names of Rafsanjani and his sons as the corrupt elite who have benefited from the former Islamic Republic presidents, during the debate with Moussavi, everyone expected a serious backlash from Rafsanjani. 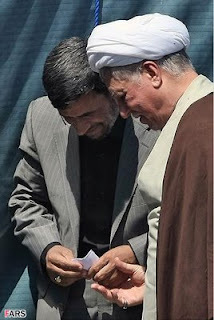 Yet on the surface it looks like both are smiling as the two pass a letter to each other through Ayatollah Janna ti above and having a friendly chat with each other below. So what is going on? what is in the letter and is there something more sinister behind the smiles and the whispers? I am ecstatic to see them at their throats. Let them have it!